I was waiting to write a post after my blog makeover was complete, I am just waiting for the new header, I won a make over from Kristina of Kaye Luxe Design by entering a contest through Anett from Bella Pummarola ... to say I was excited to win would not be a good enough word to convey how happy I was about it... I had been thinking how I needed to have an overhaul of my blog, as change can be really good. However; I did not have the money I needed to do this, nor the technical ability... so winning this made me see how blessed I was that the opportunity came about after I had been thinking about how I could make the changes. This week was also a difficult one for me, it found me using excuses... so much so that I couldn't even write, each time I sat down to write, I would find something else to do... Writing meant that I would have to admit that I was using excuses and I am not one that likes to admit that I have allowed a trial to win or control me. Some challenges are more difficult to deal with, especially the kind where I can't stand up and defend myself. I am one of those people who wants to defend myself when I feel attacked, this trial had me frozen though, I kept thinking how unfair it was that I was not able to defend myself but as the week moved on, I knew that no amount of defending myself would change what was said or done to me... Sometimes it is true and that I have to let go, walk away and not look back because defending myself would just be giving it more power. 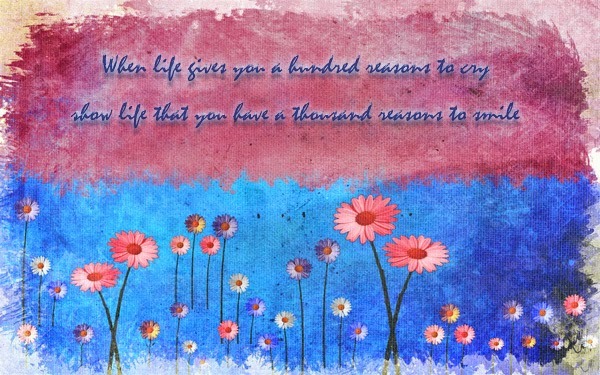 Then I remembered the quote above and realized my best answer to this trial was not to say Why me?... it was to say Try me... I am not giving up on myself because of one petty trial or challenge... I am much stronger than that. We are starting another challenge at work to lose weight but really more to get healthy... I am using that to kick start this Spring into the Summer to become the best me. I have my Fit Bit that I am going to be using to keep track of my steps and keep my goals in line. Nice. I like "Try Me". Sorry you had a bad week. As Scarlet O'Hara said, "Tomorrow is a new day..." - something like that. I hope you have a much better week. Lovin' the new look so far. I really love your new look and I always love your attitude! I was down with a terrible cold last week and used it as an excuse to slack on everything -- I am back at it tomorrow! Better get ready to walk my friend! Sorry to hear you've had a bit of a bad week ...... hope things improve. E' sempre una gioia venirti a trovare!!! Great post! You are just amazing! I like the new blog. Launna, I absolutely love your profile pic. You look radiant! :) I agree with Betty in that you are amazing, and I also like the new blog. Sending you a hug and best wishes. That's our girl. 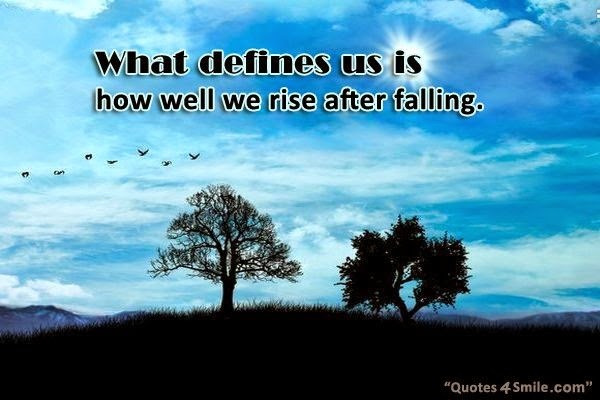 If somebody knocks you down, get back up, dust off your derriere, and keep on going. And try to do it with a smile. 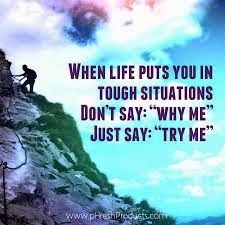 Your "Try me" as opposed to "Why me?" is a good healthy response. I love your new header Launna. I think everyone should live by that quote! I like "Try me". When I'm attacked I'm like you - I always want to defend myself and try to make sure the other person understands exactly where I stand. I'm finally learning that it doesn't really matter what they think - as long as I know the truth that's all that counts. I've been working on focusing on each day and trying not to think about the next - otherwise my anxieties get the best of me. I hope you have a wonderful week! Your new blog looks amazing! Like always your post makes me think...I always want to write posts like yours but I never know how to start it. I have so many struggles and feelings that I want to put into words but don't know how. And Launna, tell me, please fill me in as to how you've been? <3 I really missed you!! A LOT!! HEAPS!!! Btw, I love "Try me"!!!! And thanks so much for another inspiring post Launna!!!! I am loving the blog makeover, Launna :-) I am revamping my blog later today as well, to celebrate the start of spring later this week. As always, another wonderfully inspiring post. "Try me" I like it! dear, I wish you a wonderful week with my heart. So great about the makeover for the blog! Oh, I think the transition of spring and the time change can certainly set us back ..at least a day or two. I know it has me. Talk about a dangerous Monday, etc...oversleeping, almost near fender benders..I so hope this week is a wonderful one for you. All the best to your writing and your blog! I wish you a lovely week dear! Today I found out I have been lied to in my relationship throughout the past 6 months....... so I needed to read this and your amazing quotes.. It's helped me to remember my strength. Thank you Launna! Congrats on the win!! I love this design. I will have to steal this try me attitude instead of beating yourself down. Hope you have a great start of the week. molto bella la nuova grafica del sito cara Launna!!! I'm so sorry that you'd a bad week, but remember you are a beautiful and stong woman! This post is so cute for me, thank you for sharing! A crisp and fine looking template this one. Congratulations on an awesome win. Trials are a norm. They continue a lifetime L.
I'm so sorry you had a so tough week Luanna, but you are a strong person so I'm sure you'll overcome it!!! PS. the new graphic of your blog is very very nice ! launna, i love your new blog design. it's so clean and stylish! congrats on your win. i'm in awe of your self-reflection. this is pure strength, believe me. and sometimes we all procrastinate. but we have to fight against it, seize the day. but sometimes its also okay to just let things happen. 'it is always going to be Try me' , thats a great motivation. keep up on it. you'll make it. i'm glad you like my impressions of vienna. the city is way too beautiful. and it's much more beautiful if you have someone loved by your side to share these impressions. i'm glad i have le boy. thanks for all of your wonderful and warm words. I'm exactly the same trying to defend myself and ever so often I find no one wants to hear the reason. Well done on winning the overhaul. Launna you're a brave soul and I must say Congratulations and your new blog layout looks absolutely stunning! Hi lovely Launna. That was I thought so too about you because I usually see you checking on how I was doing. I was about to check on you but I even can't help myself to reach out my own blog. I took a couple day ms off from blogging to finished the boys projects. Congratulations on winning the blog make over :). I know it mean a lot to you:) I'm so happy that you were the winner so you don't have to spen a penny on blogs needed. Just so you know, you're always in my thoughts and I want you all the best as we all do. I love the quote that says "try me". I love how you won't give up it easily:). Facing the problem is the hardest thing to do but as we are strong and that means all in controls we should all okay. You are blessing to be such s a strong one! My heart goes to you:).i believe that everything is going to be so fine with you as long as you keep doing what you doing:).I very really wish you all the best my dear Launna. Oxoxoxoxox. Being prepared ahead of time is the best way to circumvent those excuses. This is so true. Nice post! I LOVE LOVE LOVE the new look on your blog!!! So classy! It really does look fantastic! a wonderful new blog design sweety! wish you a great rest of the week! o seu layout esta maravilhoso sucesso, sucesso e muito sucesso um abraço. Have a sweet day sweetheart. Oh Launna love, forever inspiring and always full of love. One thing I lov about you is your resilience and also the way you do stuff not because you expect something in return but because it has to be done..you are the epitome of a good example. Launna. I'm glad to hear from you again last night. No thank you Launna, all we need is love. I just hoping you will have a good day and that through the week:). I'm doing so far so good only busing with the children stuffs. Thanks for the bday wishes, dear! Dear Launna. I just wanted to dropping by to say hello and good night to you. Please stay safe and be careful on the way to work:). I'm so sorry that you still having the snow storm over there. Hoping it would stop tomorrow fro you:). You're the lovely one and here oxoxoxoxox nighty night Launna. You know what Launna..your words are always so motivating and inspiring! I love how you beautifully give words to all your emotions and whatever you are going through! Penning all this so beautifully is an art! Hi Launna, thank you for your comment, is the sweetest! If you ever need to talk to someone you know that I'll be glad to be your listener! I know that I can do the same with you, and I thank you so much for that. You're such a special woman sugar! Happy wed My dear friend!!!! The new look of your site looks great! You find the best words to describe everything. I'm doing fine, working a lot in the blog, we will have a giveaway soon. I visited a friend that was ill during the weekend and I didn't spend so much time in the blogs. Have a great day Launna! Passando para ti deseja um dia espetacular amei. Great post, amazing!!! Che bello incontrarti nel tuo blog! Buona giornata e buon lavoro!!! Sorry you had a bad week. I know how you feel when you sit down and can't write though, I get that sometimes, but it does all come together! Dear Launna, I love the new layout of your blog. You look so lovely in that picture. And congrats for your win. Have a wonderful day! I love new look of your blog! I wish you a wonderful evening, bye! What a wonderful quote. Words can really help get you through trying times. I'm so happy you won the blog overhaul. How exciting! Can't wait to see! I think that your layout is so pretty! Love it! Some challenges are really difficult! But when you are positive, I think you can always deal with them! Always give it a try. Have a great week dear Launna! Well written, Launna. Yes, repeated trial and experiences makes us strong. It gives the feel of confident. Your blog makeover looks excellent, very professional. Hi Launna, thanks for your recent comment on my blog. I appreciate that you understand my rants about not blogging so much now. Everytime I read your posts I have learned a lot, thanks for sharing your thoughts and your wisdom. Btw, I also love your instagram posts/quotes. Bom dia querida DEUS te abençoe e te guarde nete lindo dia. Have a nice day my sweet Launna. Well written post Launna! Congrats for winning the header makeover. I think that is a very positive way to look at things...it's so easy for me to feel stressed and ask God why, why me....but I want to be able to stand up to and overcome these struggles, in the end it becomes better. I'm so sorry to hear that you had a tough week, but once again I admire you so much for turning every difficult situation into a challenge, into a trial. I'm telling you this because I'm that person who thinks "why me". Reading this post made me see the things with a complete different point of view and dared me to face them with a different attitude, so thank you so much. Launna dear I love the new look of your blog and congrats, didn't know that you won it! And yes being honest I too sometimes find excuses to defend me but it feels great when we overcome that phase and things get better. And your inspiring quotes really speak to me. its our attitude to it that makes a difference. Launna....I'm out of town but had to stop by. You're amazing to me. Strong and brave and a fighter. Hugs. I am in love with the perspective you put out here. As always, you give me hope that I will be okay. P.S May you have a beautiful summer this year!